Cross media campaigns can help your parent organization increase its visibility, grow its customer base and increase its profits—and your in-plant can help. Here are some examples to inspire you. What is there not to love about the cross-media marketing campaign? It brings time-tested direct mail into the mix with digital technologies in spectacular fashion—and we say spectacular because not only does it look good, it serves a purpose—a big purpose: to grow the customer base and make money; to increase responses and make money; and to expand visibility (and make money). Why wouldn’t your in-plant want to be part of this process? Yet cross-media is a service that many in-plants are not pursuing. To give you some ideas, we’ve assembled three examples of effective campaigns (thanks to our friends at PODi) that either stirred up dormant end users or showcased a company’s capabilities to its customer base. One was developed for a college by an outside marketing services provider, though it’s not beyond the capabilities of many in-plants. Perhaps these examples will inspire you to develop your own cross-media campaigns. Background: Rosemont College is a private, Catholic liberal arts college. This suburban Philadelphia school was founded in 1921 and has an enrollment of approximately 900 students. Campaign Objectives: The college sought to increase its annual fund participation and total dollars raised for its latest fiscal year. The school was confronted with a considerable challenge: a capital fund­raising campaign was being run at Rosemont simultaneously. That limited the number of prospects Rosemont could reach out to, as many longstanding donors had pledged to the capital fund. In order to realize its goals of increasing donations to the annual fund, Rosemont had to bring in new donors and increase the gift size from past donors. Target Audience: The campaign focused on 10,000 alumni, parents, friends and campaign prospects. Structure and Components: Allentown, Pennsylvania-based Pacesetter Enterprises devised a yearlong campaign with five phases that included four variable direct mail pieces and 12 variable emails with personalized URLs (PURLs ) sent throughout the campaign. These PURLs pointed respondents to different areas of Rosemont College’s website that were pertinent to them. Respondent activity was tracked and used to develop subsequent messages. A variable template was created to ease the process of managing copy and link changes for the personalized microsite. Donation reply cards were customized with variable pledge amounts directly related to their last gift amount or graduation year for those who were non-donors. Since donors historically pick the middle ask amount—as to not look cheap or give too much—the reply card used the donor’s previous gift amount as the first check box. That led many donors to pick the next box, which ensured an increase in gift size. The data used to determine variable copy was graduation year, donor status, past gift amount and college relation. The first phase saw direct mail and emails sent that directed recipients to a video embedded into personalized landing pages, which featured footage from Rosemont’s convocation. Respondents were asked why they keep Rosemont a part of their giving plan; non-donors were asked what criteria they use when deciding where to make charitable donations. The goal of this phase was to gather decision-making information for their solicitation base. Phases two through four focused on how each recipient was related to the college (undergraduate, graduate, parent/friend, campaign prospect). Variable copy, signatures and images were used based on the criteria. Each direct mail and email piece focused on the Rosemont experience that each recipient had and how the annual fund played a role in helping to make it a reality. During the holiday season, a giving back campaign was launched. It included a versioned appeal focused on how Rosemont students give back to the community, as well as a video email that showcased the school through the holiday season. The campaign ended with a 60-Day Challenge that inspired past donors and non-donors to renew their gift by June 30. A Challenge brand was created that was used on all variable direct mail and emails. Results: Rosemont College increased total giving to the annual fund by 25 percent and saw an almost 1,700 percent return on investment. Nearly 88 percent of donors either maintained or increased their gift size from the previous year. Online giving shot up by 165 percent over the previous year. This also benefits the college, as online donations require significantly less staff time to process. 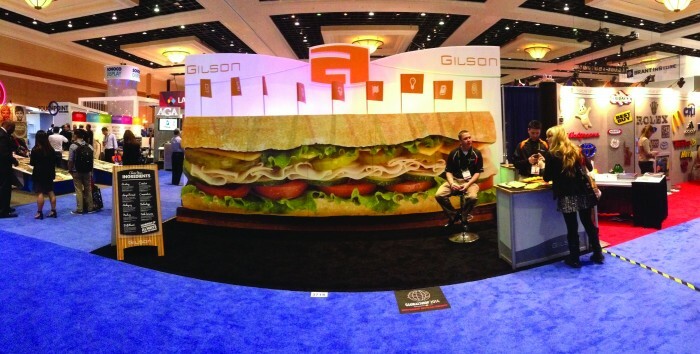 Gilson Graphics created a 19-foot-wide sandwich that reinforced the look and feel of its campaign. Background: Gilson Graphics works with hundreds of clients every year on the design, production and implementation of integrated campaigns, according to Kim Elmore, marketing manager. It has a formula to define the audience and a communication process that was created to maximize returns. Campaign Objective: Gilson Graphics wanted to increase awareness of its role as a marketing solutions firm by developing a campaign for a trade show that illustrated its ability to create and implement a marketing solution from concept to completion. As such, Gilson Graphics feels it has nine unique services that are not typically offered via a single provider. Bolster booth traffic and generate qualified leads. Arrange post-show meetings with prospects at their location. Obtain new quote opportunities following the show. Target Audience: Visual merchandising and retail marketing professionals attending the 2014 Las Vegas GlobalShop trade show. Structure and Components: The campaign theme was based on a “lunch and learn” event held previously that included sandwich-themed imagery and metaphoric messages about their marketing “ingredients.” This was incorporated into the new campaign, along with casino chips that were used at a previous GlobalShop event. The campaign was broken into two segments: phase one was the pre-show marketing campaign, with phase two featuring an at-show promotion. In phase one, the direct mail campaign included print and digital components. Pieces were printed to look like sandwiches with variable customer data and PURLs for event registration (concealed by a Z fold). The piece encouraged attendees to visit their PURL and request either casino chips or snack chips (depending upon show attendance) along with a customized marketing kit. The pieces were spot UV coated, diecut, hand folded and inserted into #10 envelopes. A second mailing 10 days later reinforced the original message with some of the same components—variable data printing, spot UV, diecutting and hand folding. But the second pass was sent in a 6x9˝ clear envelope. Gilson’s in-house Web services team developed the personalized microsite with an online form to request a casino chip at the event. Non-attendees received the marketing kit with a bag of snack chips instead. Show attendees were prompted to request a meeting with a Gilson representative, at which time they would receive a bonus of “double the chips.” An automated email went to both the customer and a Gilson rep to ensure efficient communication. Phase two saw Gilson’s large-format group construct a 19-foot-wide sandwich that reinforced the look and feel of the pre-show campaign. The display included a sandwich sign and simulated wooden tabletop. The booth was primarily constructed from Falconboard, Coroplast, Sintra and Ultraboard, demonstrating Gilson’s ability to create signage and POP displays out of a variety of substrates—a key point of interest for many retailers. Gilson’s sales team encouraged booth attendees to engage with the various display elements and request their casino chips, which required a badge scan to provide contact information for sales follow-ups. Pre-show registers were noted in the lead retrieval survey. At show’s end, the disposable booth graphics were donated to a local educational non-profit, eliminating the cost of shipping the one-time-use graphics back to Gilson’s headquarters in Grand Rapids, Michigan. A 5.7 percent rate of return on the direct mail campaign. Of that total, 70 percent were identified as hot or warm leads. Ten post-show meetings with new prospects. Seven major quote opportunities from different companies within one week of returning from the show. Four new major national retail clients. “Since this campaign, we’ve implemented similar multi-touch strategies for other events and the results have been equally impressive,” Elmore notes. “For example, we used a similar strategy for a holiday campaign last year to drive new business inquiries and, out of 500 pieces mailed, we yielded an unprecedented 800 responses—yes, that’s right, a 160 percent return. The sales staff was over the moon. Background: Founded in 1903, Hodd Barnes and Dickins is one of the oldest independent opticians serving the professional community in London. Campaign Objective: As a large portion of the optician’s client base consists of people who work within close proximity in London, many tend not to return when they later obtain employment outside of the city. HBD wanted to target those lapsed clients by engaging them with an enticing offer that would bring them back to the practice. In addition to reclaiming past clients and increasing foot traffic, HBD hoped to increase the average spend per customer and garner information for future marketing activities. Target Audience: Roughly 1,500 lapsed clients from the optician’s database who had not visited the practice since 2012. Structure and Components: UK-based d2rCross­Media developed a campaign for the optician consisting of a personalized direct mailer with a PURL, which directed to FirstLast.YourEyesMatterAtHBD.com. Personalized emails were sent to follow up with customers. The list of 1,500 lapsed clients was broken into four segments: male under 40, male over 40, female under 40, female over 40. Each of the target groups was assigned a different message on the direct mail pieces, the PURLs and the emails. As an enticement to go online to the PURL, customers were offered a £50 voucher, redeemable on their next visit to HBD. The direct mail piece was an A5 postcard sent in a brightly colored envelope to increase open rates. The postcard had imagery and copy relevant to one of the four target groups and included the PURL. Once on the landing page, visitors were treated to a video describing the optician’s eye care services. The next Web page gleaned information from the customer—possible sight problems, sporting activities needs, personal information, etc. Upon completion, a “Thank You” page displayed—which included a link to HBD’s static website—and the discount voucher was emailed. Alert emails were sent to HBD when someone hit the landing page and another when someone claimed a voucher. That enabled staff at the optician to do a follow-up call and book the client into an eye exam. Results: HBD saw 122 unique visits to its landing page (8.26 percent). A total of 56 people downloaded a £50 voucher to redeem for eye care, a 3.79 percent response. HBD also reported revenue in excess of £20,000 from the first sales as a direct result of the campaign, which represents a return on investment of 500 percent. That figure will increase further when the lifetime value of the clients is taken into account.